A quick and easy no-bake chocolate + peanut butter dessert, perfect for last-minute holiday treats or gifts. Buckeyes! For those of you not in-the-know, chocolate-coated peanut butter truffles! Nothing, absolutely nothing, beats the flavor combination of dark chocolate and peanut butter. Am I right? It’s like THE ultimate flavor combination. 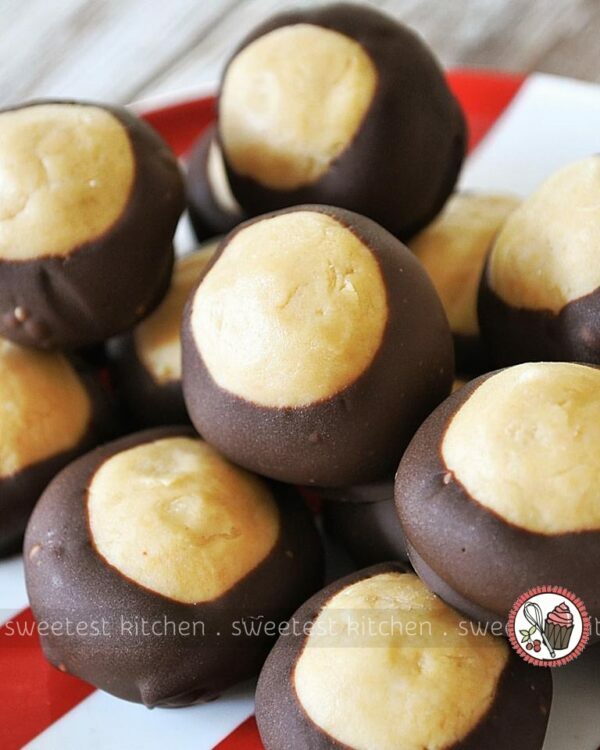 These particular types of buckeyes hail from the state of Ohio, which is the neighbor of my home state, Indiana. Real buckeyes come from trees, and in fact, the buckeye tree is the official state tree of Ohio. One day, someone (probably in Ohio) was clever enough to model a ball of peanut butter, dipped in chocolate, into something resembling a real buckeye. And somehow, buckeye candy became a pretty popular holiday treat (especially in Ohio). There’s a lot more information I could give you about buckeyes (the real ones), but if you’re really that interested, feel free to go google about it. Because I’m actually here to give you the recipe for these deliciously moreish and sweet little balls of peanut buttery chocolaty goodness. This recipe is adapted from the classic buckeye recipe, from the good old American god of peanut butter, Jif. Now, I did say that this was a no-bake, no-cook recipe, but that’s not entirely accurate. You will need to melt some chocolate, but that’s hardly considered cooking, right? The original recipe says to use an electric mixer, but I didn’t, and it still turned out perfectly. You decide which route you want to take. I used natural peanut butter, because I prefer natural, and it worked fine. If you haven’t got your holiday food goods sorted yet, I hope this post has helped you out. All you need is a cute little gift box (make your own origami truffle boxes, or a paper plate box) decorated all Christmassy and you have pretty much just won Christmas. Totes. A quick and easy no-bake chocolate + peanut butter dessert, perfect for last minute holiday treats or gifts. Combine peanut butter, butter, vanilla and salt in large a bowl. Beat with an electric mixer on low speed until blended. Add powdered sugar, beating until perfectly combined and a firm, smooth dough forms. Note, you don't need an electric mixer for this; just use a wooden spoon and some stirring power, eventually giving up the spoon and simply kneading the mixture together with your hands until that smooth dough forms. You'll need it to be able to stick together in a ball shape with no crumbly bits. Using a 1-tablespoon measure, shape the peanut butter mixture into balls and place onto a parchment/baking paper-lined tray. You should get around 2 dozen. Refrigerate for 30 minutes. Meanwhile, melt the dark chocolate using your preferred method (microwave or double-boiler; I use the double boiler method). 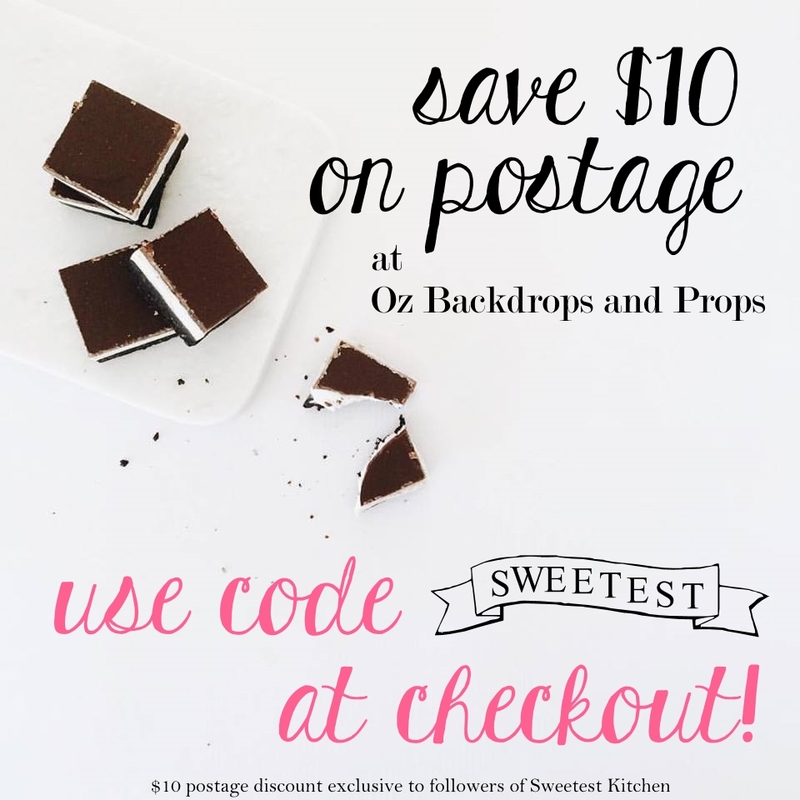 Transfer the melted chocolate to a tall, thin cup or glass. Use a toothpick to stick into each of the peanut butter truffles and pick them up, one by one, and while holding the toothpick, dip the truffle into the melted chocolate, almost to the top, but not quite (refer to above photo). If you find your truffle falling off the toothpick, use a fork, or extra toothpicks, to help hold the truffle on while scraping off the excess chocolate. It shouldn't fall off, though, if you work quickly. If your kitchen is warm, just take a few peanut butter truffles out of the refrigerator at a time to work with (the chilled truffles hold onto the toothpick better than when they're warm). Place the dipped truffles back on the lined tray. When finished dipping, remove the toothpicks and very gently smooth over the toothpick-hole with your finger, or the back of a spoon. Refrigerate the buckeyes for at least 30 minutes. Then, serve, or pack into your gift boxes!